We love gold hence almost every Indian home has little of it. We all know power of gold so we keep on adding gold to our portfolio. India is world’s largest gold consuming country with an annual demand of 843.2 tonnes comprising of 26.2% of total world demands. Historically, gold price have shown better stability even during period of crisis, as compared to other investment types. Most experts advise investing in gold as “must”, since presence of gold creates strong portfolio that withstands market fluctuations. Gold has provided stable returns in long run. Out of this Gold ETF is smarter way to invest in gold. 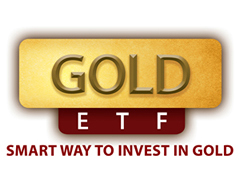 Gold ETF are mutual funds listed on stock exchange. The investment objective of Gold ETF is to provide returns that closely correspond to the return provided by domestic physical gold rate. Gold ETF is simple, safe and reliable way for investment in gold. Let’s check out advantage of investing in Gold ETF. In gold ETF you need not to pay any additional premium or making charges. You end up paying these charges when you purchase gold coins & bars from bank. If you purchase jewelry you need to pay additional making charges. If you purchase gold in physical form you will always worry about its safety and may end up paying for bank lockers. Buying gold etf is purchasing gold in electronic form. You can buy them just like you buy stock of any company from your broker. As Gold ETF is in demat form there are no worries of theft and you also save on locker charges. Gold ETF can be sold any time through your broker or by self at single mouse click, you will get same price for your gold etf across india but if you are planning to sell gold coin or gold bar banks don’t buy back and most jewelers only offer exchange and but not buy back. In terms of taxation benefits, gold ETFs are way ahead of the physical gold. On gold ETF, you pay no security transaction tax or wealth tax. No VAT or sales tax applicable on Gold ETF. Gold ETFs provide an opportunity to investors to accumulate gold over a given period of time. Since it can be purchased in small quantities, one can plan the procurement as per future requirements, say, for the marriage of children, etc. As per us Gold ETF is smarter way to buy, store and sell your gold. 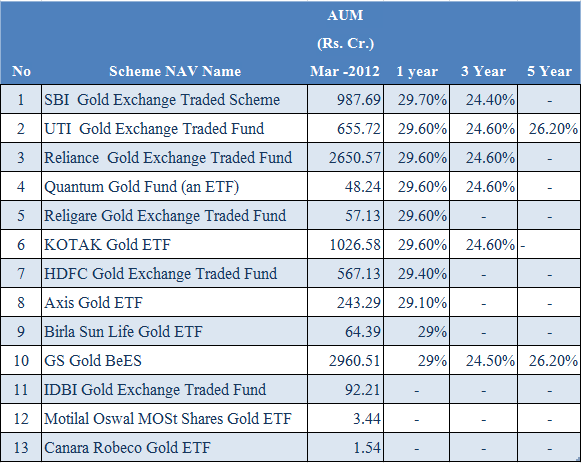 There are around 14 Gold ETFs scheme available. To make your selection job easier Top Gold ETF scheme with return information is given here. 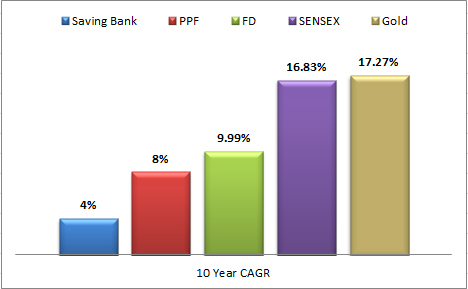 Note: Returns have been calculated based on NAV’s as on Jun 08, 2012. Do share your comments/views on this article.